Can Social Media Beef Up the Image of McDonald's Food? While fast-casual restaurants continue to eat up market share of the restaurant industry, McDonald’s is eating its heart out after four months of declining U.S. same-store sales. The problem appears to lie in the perception of the food. Fast-casual restaurants are seen as serving fresh and healthy menu options, while fast food places like McDonald’s are believed to sell food that’s unhealthy and not natural. Now, McDonald’s is hungry to improve the view of its food and thinks that social media is the recipe for changing people’s perceptions. This has led McDonald’s to launch a new social media campaign designed to take real questions from consumers and deliver real-time answers. Forbes.com reported on whether this approach to social media will bring consumers back to the table. McDonald’s has long believed that consumers want value and novelty. As a result, they’ve focused on rolling out special price promotions and new menu items. There was a 20% decrease in Millennials’ visits to fast food chains during Q3 2014. And an 18% decrease in Baby Boomers’ trips to fast food chains in Q3 2014. Plus, an 11% decrease in Gen Xers’ fast food chain visits in Q3 2014. 13% of Millennials said they thought fast food was merely cheap and barely edible. Baby Boomers expressed a desire for quality food, which they did not believe was offered in fast food restaurants. Gen Xers wanted their food served fast, but not at the expense of quality. 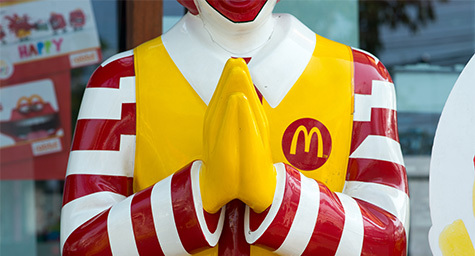 Apparently, McDonald’s perceptions about consumer perceptions were wrong. Rather than craving savings, consumers want quality food and they’re willing to spend for it. And they believe that fast-casual restaurants provide quality food in a reasonable amount of time. Clearly, McDonald’s needs to reinvent the brand to satisfy consumers’ desire for quality and focus more on fresh than fast. So why is McDonald’s turning to social media to respond to questions that research has already answered? Because using social media will convey their new commitment to quality and show consumers how they’re changing to please them. After all, social media’s greatest value is the way it allows brands and consumers to connect over issues that matter to them. And by using social media to share their newfound focus on freshness, McDonald’s will be telling consumers how much their business and happiness matter. Connect with the latest in social media. Contact MDG Advertising today at 561-338-7797 or visit mdgadvertising.com.